Love cotton candy? Looking for something fun to whip up and serve at your next party? If so, you're going to enjoy this special recipe from the great folks over at Sparkling Ice! 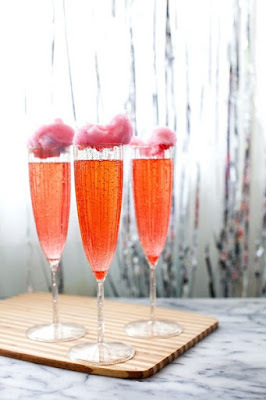 Fill champagne flutes with champagne and Sparkling Ice Cherry Limeade. Place a small 2" piece of cotton candy on top of glass as a garnish. Push the cotton candy into the glass for a fun disappearing effect. Disclosure: You must be 21 years of age or older to consume alcohol. Please drink responsibly and always use a designated driver. I have thought to add cotton candy to a drink. It sounds like a different way to make a cocktail.